This goes against everything I would have believed 5 or 6 years ago. I thought I had it all figured out as I was controlling every variable in my personal study experiments. That was, of course, until the days I didn’t. Don’t worry about controlling every variable. This probably sounds terrible to most people as committed to the scientific method as I am. It might sound like downright stupidity but I think this is one of the most powerful things you can learn about running a successful personal study experiment. Controlling every variable is impossible. You don’t have the resources to even come close to that. Attempting to do too much can lead to more stress than the results can justify. In the past I ran study experiments by creating objectively similar sets of flashcards and testing myself using different strategies to learn the information. This was an awesome way to learn about studying but it took a serious investments of time. 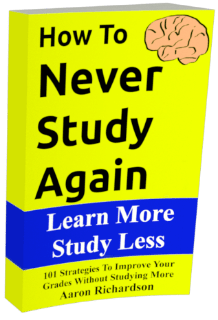 Since I was spending so much time learning about how to study better, I was using up a large amount of my motivation just to learn more about my results. I would waste hours every few nights running an experiment like this and, honestly, I’d just get worn out. It was type a. It was obsessive. It was powerful but damn was it costly. Your goal shouldn’t be to run the perfectly controlled experiment. The reality is that just by being you you’re controlling for many variables. You’re controlling enough variables to learn what you need to learn. Most people keep a relatively constant schedule. That schedule is what can help you control a huge number of variables without even trying to. Take advantage of that. To control all your variables reasonably well (for personal inquiry, not for verifiable peer reviewed science journal submissions,) you don’t need that much planning. Instead of thinking about creating perfect little experiments, think about larger chunks for your experimentation. Don’t do an individual experiment using flash cards to try and measure how much you can improve your recall. Well… you can but don’t rely on this being your consistent strategy. Consider it as a bonus. Instead, do a long term experiment testing using flash cards instead of your traditional study strategy to learn school material. Don’t just test your recall. Watch your grade for a few weeks and see what happens. Watching your grade ensure you’re paying attention to what your real goal is. Grades are a hard to control variable. You don’t know when your teacher is going to be giving you easy work and when they’re going to be giving you hard work. That means this can be a little hard to trust in the long term. Is your grade going up because you have a better strategy or because you have easier work to complete? You can try to fix this problem by controlling more variables but you’re really just adding stress to a situation that doesn’t have to be so hard. Never stop your testing process. If you still see better grades 6 months from now and you’ve only made one change then you can virtually guarantee you produced a successful improvement. Over time the variability of classwork difficulty is no longer a relevant factor. Time evens it out and reveals the true nature of your results. Most importantly, this should never stop and you shouldn’t even want to stop it. If your experimentation strategy isn’t something you could do for the rest of your life then it’s probably not going to produce extraordinary results for you. Extraordinary results are tough in short bursts of experimentation. They’re easy through a constant commitment to getting better. Keep getting better over the long term by making small changes and in no time you’ll be pushing ahead of most other students. Life is an experiment. Treat it as such and you can learn to produce the results you want. Treat experimentation like a cyclical way of getting better and your results show it. Thanks for reading and subscribing. Be sure to contact us if you have any questions or ideas you want to share.